UK's largest community-scale wastewater recycling facility converting sewage to non-potable water to supply Olympic Park venues. Clad in timber, gabion baskets and corten steel to blend within the environment. Thames Water’s Old Ford Water Recycling Plant forms a key component in achieving a truly sustainable 2012 Olympic and Paralympic Games and subsequent London 2012 legacy. It uses membrane technology to convert raw sewage to non-potable water compliant with strict quality standards and is used predominantly for toilet flushing at multiple venues and irrigation of public realms on Queen Elizabeth Olympic Park. It is the UK’s largest waste water recycling scheme, providing a new water resource in the water stressed southeast. The facility provides an enhancement of the local built environment using a green roof, nature trail, visitors centre and contributes towards the overall provision of protected habitats and open space within the Park. The scheme has a simple modesty appropriate to its location, which does not try to compete with its more famous architectural neighbours. Old Ford is a small woodland situated just 150m from the Stadium and contains a number of habitats including grassland, scrub and tall herbaceous vegetation set within the woodland. It is an important breeding habitat for birds and has many species of butterflies. Promoting sustainable infrastructure and supporting biodiversity are high priorities across Queen Elizabeth Olympic Park and these principles are embedded in Old Ford. 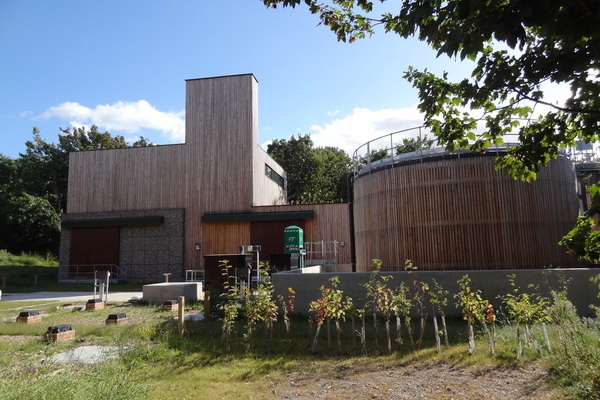 The choice of timber cladding, corten steel and stone gabions to clad the building helps the facility to blend into its natural context, and provides habitats for invertebrates, bats, birds and other wildlife. The extensive living green roof enhances the biodiversity of the site. The gabion walls are constructed from heavy duty mesh and filled with regionally sourced natural stone. They have tubes and bird boxes built into them to encourage wildlife. Climbing plants are encouraged. Timber boarding is Forestry Stewardship Certified and sourced from the UK. It is untreated to allow it to weather naturally and requires low maintenance. The natural finish of the timber blends with its wooded surroundings. An industrial and durable material that provides a good contrast to the gabion and timber walls. It is used in the adjacent Old Ford Pumping Station “cubes” and visually connects the two facilities. The self-corroding finish of this material provides a protective layer requiring no painting or synthetic finishes. The bio-diverse green roof is overlooked by residents in adjacent high rise flats and has a natural appearance which will change seasonally. This softens the outline of the buildings when viewed from a distance and provides a good contrast to the tougher materials utilised elsewhere. It significantly reduces rain water run off.